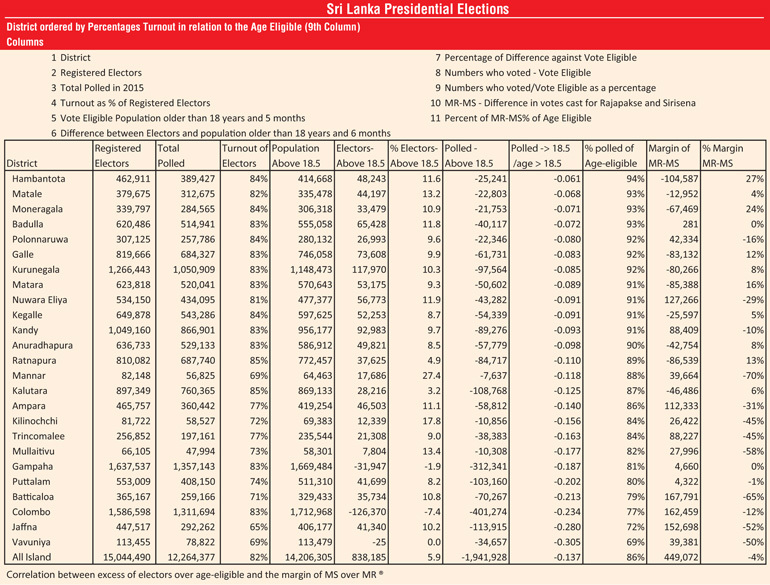 In Sri Lanka’s 2015 presidential election, 15,044,490 voters were on the electoral rolls but the number of citizens who were of legal voting age was only 14,449,000 going by the Census data. This amounts to an unaccounted excess of 4.3% in the electoral rolls. This is alarming since the last presidential election was decided by a margin of 3.7% and previous elections were decided by half as much. This phenomenon of “ghost-voters” was pointed out soon after the 2015 elections by Dr. Laksiri Fernando, who has been studying elections in Sri Lanka since 1970. He claimed that there were at least 782,460 names on the Sri Lankan electoral rolls than there were citizens of legal voting age. In the four months since Dr. Fernando put forward his claim, no one has disputed it. As we shall see below, these ghost-voters are so numerous that they can tip the results of 30- 60 Parliamentary seats in the upcoming Parliamentary elections. Under the 20th Amendment proposals, electoral reform is to increase representation in regions with increases in population. But such a reallocation of seats on the basis of the electoral rolls shall reward the most regions with the ghost-voters by 20-40 seats for decades. The actual excess shall exceed 4.3% of the age-eligible population due to the fact that one begins to register on turning 18 years after receiving the electoral forms from the Grama Niladhari – who distributes these once a year. So on average it takes six months for the voter to start the registration process. Thus the excess of 595,000 from the legal age of 18 years goes up to 762,000 with the de-facto voting age of 18.5 years and to 931,000 with 19.0 years as the voting age. But even counting the excess against those who are above 18.5 or 19.0 years is an underestimate. Due to emigration, overseas employment, education, refuge overseas, indifference and administrative shortcomings there are many citizens who are not registered to vote. The available estimates for emigration from 2000 to 2013 is 1,232,000, 570,000 work overseas and 122,000 found refuge overseas. These estimates from the UN and Government agencies shall be under counts as many leave without an official trace. Some of the citizens overseas have also been taken off the voter rolls recently unless they have someone close to vouch for their residence. The children of migrants who had been born in Sri Lanka do not get admitted even if they attain voting age without presenting themselves to the Grama Niladhari (GN). From the experience of my extended family, of the five who have attained voting age in the last decade, only three were registered to vote and two of them have since been dropped arbitrarily. I tried to get the two others registered two months in advance of the Presidential Elections by contacting the Grama Niladhari and Assistant Government Agent’s office – but was told there was no chance even if the citizen had all the papers in hand. One just had to wait for the forms. We had been filling in the forms properly each year – but year after year, the registration was not updated and we did not know of the recourse. So even taking the most conservative estimates – those above 18.5 years as age eligible, and a low estimate for those not registered, we can estimate that there should be a 1-1.5 million “ghost voters”. It is as if there was another province amounting to 7-12% of the electors that the rest of us know not of. Could these registered multiple times not show up to vote? What of the possibility that although some folks may be registered in two places, they do not actually turn up to vote in both places. The number of voters who turned up to vote in the recent presidential election was 12,264,377 amounting to 81.5% of those on the electoral rolls which in itself is suspiciously high. But if we consider this as a percentage of those who are above 18.5 years, then the turnout rises to 86%. Given those who are sick, overseas, or uninterested in voting, this rises to unbelievable levels. So these ghosts do turn up even for a Presidential Election! We next look into the excess voters by district. If the excess is found evenly in all the districts, then it is less likely that there was systematic large scale voter fraud as it shall not benefit anyone. Population data by five-year age groups by district is available until 2012 along with total district populations until mid-2014. We used the same percentage of voters in the different age groups as in 2012 to estimate the age-eligible in 2014. Statistics of electoral list is available by district from the Department of Elections. Where are these ghost voters found? Kurunegala has the highest number of excess voters (map on left) followed by Kandy, Galle, Badulla, Nuwara Eliya, Matara, Kegalle, Anuradhapura, Hambantota, Ampara and Matale. The districts that in percentage terms have the highest excess of electors than age-eligible were Matale and Hambantota followed by Nuwara Eliya, Moneragala, Badulla, Hambantota, and Kurunegala. The populations of districts vary 20-fold. We should therefore pay attention to both the actual number of voters in excess of the age-eligible and the percent increase of the excess in each district. Thus if the number of voters in a district is small and the percentage is large, it is not as consequential for a presidential election. If there is an excess in voters by a large number in a populous district, it too may not be a signature of malpractice. Next, we can check on the numbers who actually voted as a percentage of those who were age-eligible by districts. While the national average was already suspiciously high at 86%, this figure went up to 94% in Hambantota, followed by 92-93% in Matale, Moneragala and Badulla (see map in centre). By comparison, Vavuniya, Jaffna and Colombo were in the 60-70% range. The voter turnout in Kalutara and Ratnapura was highest in terms of those on the electoral rolls, but it is not the highest in comparison to those who are age-eligible. This example shows the need to consider the age-eligible to suss out manipulation in electoral list. Overall, the ghost voting is highest in Southern, Uva, Sabaragamuwa, Central and North-Central Provinces along with the Kurunegala district. There could be ghosts in other districts who are masked due to low turnout because of other factors as in Gampaha, Ampara and Puttalam. The Department of Census and Statistics provides online the data to directly estimate the excess for 2012. The latest statistical abstract provides district-wise numbers of electors and those above 18 years for 2012. There is a 2% excess of electors over those above 18 years with the highest excess being in Kurunegala, Kandy, Galle, Badulla, Kegalle, Hambantota and Nuwara Eliya. The highest percent excess is in Matale (9%) and Hambantota (8%) followed by Badulla, Kurunegala, Galle and Nuwara Eliya (7%). The estimate of 2% of excess voters for 2012 from the Census Department is compatible with our estimate of 4.3% for 2015 as there is a doubling in ghost voters between the 2010 and the 2015 elections. Even as the national population only increased by 1.7% between 2012 and 2014, the voter rolls expanded by 4.1% in the last few years. It is instructive to check for ghost voters in past elections. If one goes back to 1981, at a national scale, there were 8,670,319 who were above 18 and the number of electors in the register in 1982 was 8,145,015. Thus in contrast to the 2% excess three decades later, the number of electors was 6% less than the age-eligible. The total number who voted was 5,768,662 which amounted to 70% of the electors and 67% of the age-eligible. The ghost voters came in at a large scale around the 1999 election and surged after the 2010 election. Thus the overall methodology is independently confirmed by the Census Department in addition to by Dr. Laksiri Fernando. The only way the estimate of a million or more ghost voters could be wrong is if the data from the Census Department is hopelessly wrong. Still, this claim is so incredulous that we must remain open to questioning the sacred cows for statistics in Sri Lanka. But we have enough confidence to go looking for a motive. Who benefitted from the ghosts? The districts which had more percentage of ghosts (map at centre) also coincide with the districts that the incumbent came ahead (map at left). Where there were more excess voters (deeper shades of red at centre), the incumbent did better (deeper shades of blue at left). The exceptions are few with the biggest being Nuwara Eliya, Gampaha and Polonnaruwa. In statistical terms, the correlation is highly significant (r=0.612, p<0.0015). This pattern of unreasonable and consistent higher voter turnout in regions where incumbents are favoured is a signature of voter fraud. The low turnout of north-east voters and in Colombo counters the argument of Rajapaksa supporters that north-east voters were taking advantage of the improved roads to vote in the Western Province as well but does not disprove it. The 70% range in these regions is what used to be the case in the 1970s across most of Sri Lanka. The Southern Province on the other hand had ghost voters even in 1981. Could voter roll manipulation be an explanation? The Elections Commissioner, respected international observers and the organisations that monitored the elections (CAFFE, CMEV, PAFFREL) had proclaimed the last election fair even while they acknowledged various shortcomings including the lack of protection of the independence of the Elections Commission. 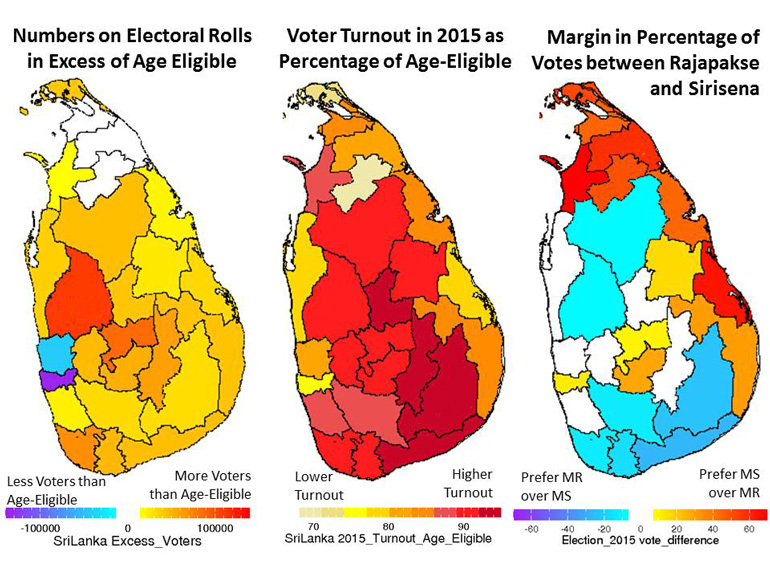 In a previous article (https://www.colombotelegraph.com/index.php/higher-voter-turnout-for-mahinda-due-to-enthusiasm-war-or-jilmart/), I had pointed out how the pattern of high voter turnout in areas that favoured the incumbent was contrary to the opinion of most that he had lost the enthusiastic support of the voters, unless there had been fraud in turnout. The evidence in this article is overwhelming that the voter rolls had been fraudulently inflated in areas that favoured the Rajapaksa regime. There is anecdotal evidence of bottlenecks to registration in other areas. Along with this there needs to have been voting by minors, by the same person multiple times, repeat voting by postal voters or ballot stuffing. Given the critical importance of the vote to politicians, we may be naïve not to expect voter list manipulation and voting malpractices – it is the easiest way to win votes. The registration process is opaque and detection of electoral fraud difficult. The focus of most of us is on what happens during the election campaign, and even if fraud is detected, it is left as anecdote. It is now widely-acknowledged that Government services have been politicised, and that fraudulent practices took place routinely within the Government machinery such as the national broadcasters, the transport services, and even the Tourist Board. Indeed, Dr. Laksiri Fernando wrote in a follow-up article: For a long time, the SLFP organisers were manipulating the electoral registers, to my information and knowledge, through their appointed Grama Niladaris and other functionaries. We learn from the Police of the detection of an instance of a Minister’s spouse getting a second birth certificate and a second passport under a new identity. The official in the Emigration Department as a matter of routine just gave in. Under these circumstances, it seems reasonable that the Grama Niladharis shall succumb more readily as they are more vulnerable. If birth certificates can be faked, it shall also get past a conscientious Grama Niladhari. Some of the politically supported officers may also have willingly abetted fraud. In this case, an easy way to suppress voters completely legally would be to delay registering voters and taking voters off the list in areas that do not favour the incumbent. The last presidential election was decided by a margin of 3.7% or a margin of 470,000 votes. If the million excess votes cast was largely cast for the incumbent (80%), then the majority for Sirisena shall go up to 1,070,000 or 8 to 9% of the votes cast. Sirisena shall have garnered 60 lakhs and Rajapaksa 50 lakhs of genuine votes. Even if the votes cast had followed the pattern of each district, still the vote margin for Sirisena shall increase by at least two lakhs. If fraud of this scale is factored in many interpretations of the election results such as number of districts and electorates won, the percentage of majority voting for the candidates and the outcome to follow in the parliamentary elections would be very different. The electoral rolls may be stripped of its ghosts in the future but it shall not follow automatically with a new Government. The officials who were complicit in creating the ghosts remain in place and could suppress the shortcomings. The next Parliamentary elections shall be compromised in favour of those close to the former regime. What is required is attention to the problem and an independent and transparent audit of the voter lists. The proponents of the 20th Amendment proposals say that additional seats shall be allocated on the basis of the increase of population and this sounds fair on the surface. However, if the reallocation is undertaken with the existing voter rolls, it shall reward the regions with more ghosts for decades. It shall add 10-30 MPs to the Southern, Uva, Sabaragamuwa, North Central and Central Provinces and the Kurunegala District at the expense of the Western, Northern and Eastern provinces. If delimitation of electorates and re-allocation of seats must be undertaken now, then the population data from the Department of Census and Statistics should be used to mitigate the inflation of the voter rolls of the Elections Department. Even with that corrective, delimitation of electorates/reallocation of seats shall remain unfair due to consequences of the war and likely voter suppression in unfavourable places. There has been systematic under-registration of citizens in the Western, Northern, and Eastern Provinces and also in some pockets in other provinces. Voter registration has to take place affirmatively including for those overseas, those finding refuge due to war, those who are displaced or those having difficulties in registering, if one is to be faithful to the Constitution to give every citizen an equal right to vote.